The conclave to top commanders comes against the backdrop of the army's assessment that nearly 250 terrorists were ready to infiltrate from across the Line of Control. A top meeting of army commanders is being held in Srinagar to review security situation in the state. 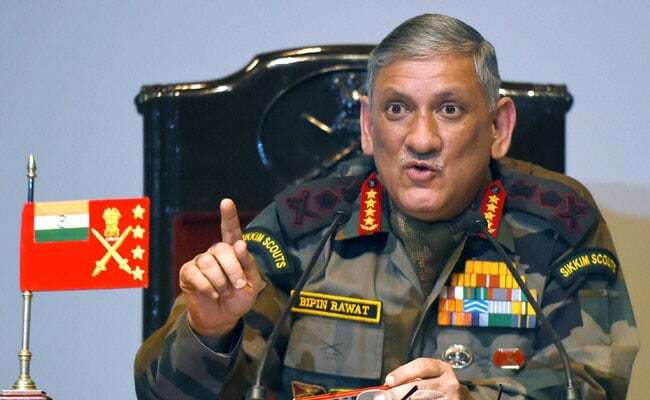 SRINAGAR: Amid continuing ceasefire violations by Pakistan, Army Chief General Bipin Rawat along with top military commanders reached Jammu and Kashmir capital Srinagar on Thursday to review the security situation along the border. The conclave also comes against the backdrop of fresh intelligence inputs that nearly 250 terrorists were ready to infiltrate from eight launch pads across the Line of Control. Hours before the meet started in Srinagar, another ceasefire violation was reported from Rajouri and Poonch districts where Pakistani army fired mortars on Indian posts. "Pakistan Army resorted to mortar shelling and firing on forward posts along the LoC in Nowshera sector in Rajouri district," a Defence Spokesman said. Minutes later, Pakistani troops also opened fire in Krishnagati sector of Poonch district. The ceasefire violations are often also linked to infiltration attempts by terrorists. It is a trend that the army expects that would become more frequent over the next few weeks and months with the melting of snow and opening of passes. The image of Hizbul-ul-Mujahideen trainees at a camp in Muzaffarabad in Pakistan occupied Kashmir that was widely circulated on social media this week was a reflection of this challenge. Earlier this month, the army had declared it would carry out "even more counter proactive counter-terrorism operations" along the border with Pakistan. On Thursday, the security forces also killed two terrorists accused of throwing a grenade at a police station in north Kashmir's Sopore.